Every year, 80 million people travel from developed to developing countries: it is estimated that up to half these contract travellers’ diarrhoea (TD), making this by far the most common illness affecting travellers1,2. There is a broad perception that TD is a trivial problem, but the reality is different: 30% of sufferers are confined to bed, forced to abandon their travel plans2. The impact upon leisure travellers and holidaymakers can be bad enough, but for business travellers the practical and economic consequences are insufficiently recognised: it can be a deal-breaker, and in terms of lost productivity alone, the cost exceeds €448 million per year in the EU – with €207 million spent on post-travel medical costs1. 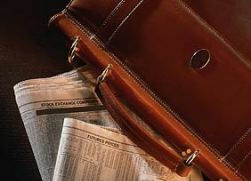 Compared with leisure travellers, business travellers are often at higher risk. There’s a misguided perception that business travel is a uniformly luxurious experience, from sitting at the front of the plane to enjoying lavish suites at five-star hotels. But the majority of people who travel for work experience something rather different: last-minute trips with little opportunity to prepare for them; a tough schedule of meetings and long journeys; having to cope with jetlag, hot or cold temperatures, disorientation, isolation and language difficulties; and eating and drinking in a setting that other people have chosen, in circumstances where it is often hard to refuse meals that seem unappetising or unsafe. A recent report by the Health Protection Agency (HPA)3 calls for much wider awareness of food hygiene precautions and preventive measures, and a much higher awareness of the scale of the problem amongst travellers, health professionals and the travel industry. Perhaps we need to focus our attention on the highly likely risk of TD as well as the far less likely, more exotic diseases that might grab the headlines. TD is a very common, very unpleasant and potentially dangerous problem yet is highly amenable to prevention and treatment. 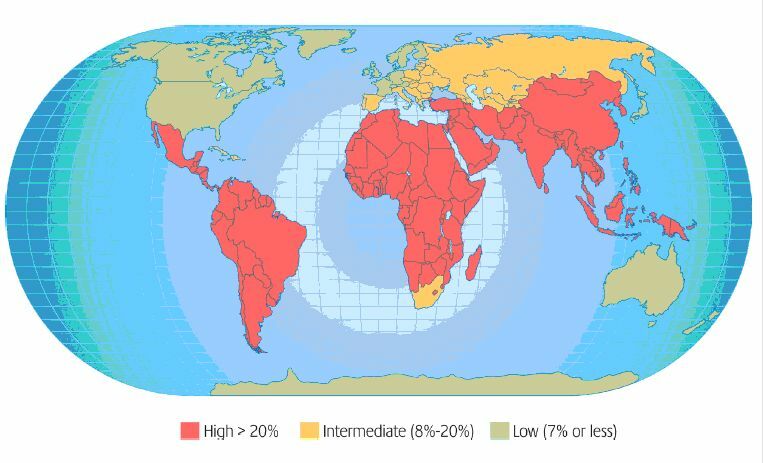 The report also makes interesting reading from a geographical perspective, highlighting Africa, Latin America, the Middle East and Asia as posing the highest risk for contracting travellers’ diarrhoea. But as the HPA itself points out, the reported data exposes only the tip of a much larger and more alarming iceberg. The data only hints at the true number of travellers who become ill abroad but do not seek help, or the numbers of travellers who receive treatment without having tests. Recent research4 on over 1,000,000 travellers on UK package holidays revealed some insight in to the countries most at risk. Egypt topped the list of all destinations with an estimated incidence of over 45%, putting the risk of shark attacks at Sharm-el-Sheikh into perspective. Closely following Egypt in the rankings were Sri Lanka, Kenya, Cuba and the Bahamas. Closer to home, Morocco, Tunisia, Turkey, Cyprus and Spain were also revealed to be areas of risk. Research shows that only half of people travelling to a high-risk country seek medical advice prior to the trip1. The situation with business travellers may be even worse – familiarity with a destination, and the sense of security engendered by big-name hotel chains can breed complacency. At luxury hotels, the risk may be even higher – with food that is more likely to be prepared by hand, leading to an increased risk of contamination2. The main cause of travellers’ diarrhoea is bacterial infection from contaminated food or drink caused by poor food standards of personal hygiene. The most common cause of travellers’ diarrhoea is infection with a particular strain of E. coli bacteria.5 Particularly risky foods include undercooked meat, poultry, seafood, raw fruits and vegetables. Tap water, ice, and unpasteurised milk and dairy products are also associated with increased risk. In the UK, we drink water straight from the tap and rarely consider that the water may be the source of disease but when the cleanliness of a water supply is in doubt, it is much safer to stick to bottled water. There are two approaches to combating TD that should always go hand in hand. The first is a cautious approach to food hygiene in high-risk countries – and indeed, almost everywhere outside your home environment when you are dependent on meals prepared by someone else. Basic precautions such as frequent hand washing, sticking to bottled water and avoiding ice in drinks, are well known. The challenge is to apply these precautions in practice: for example, when we are tired, hungry, or tempted by a delicious-looking array of delicacies. The second approach is for every traveller to seek pre-travel advice so they have a clear idea of what to do if symptoms of travellers’ diarrhoea appear. That includes: being able to treat fluid losses by using oral rehydration; using over-the-counter medication to control diarrhoea symptoms; and where necessary, using a standby treatment from your GP or travel clinic.